All ENERGY STAR® certified windows bear the National Fenestration Rating Council (NFRC) label. Using the NFRC label to compare energy efficiency is the best way to ensure that your window investment dollars get the best return in the long run. For windows receiving direct sunlight, look for ENERGY STAR certified windows for the southern climate zone, which will have a solar heat gain coefficient (SHGC) of 0.25 or lower and a U-Factor of 0.40 or less for the whole window; SHGC of 0.28 or lower and a U-Factor of 0.60 or less for skylights. ENERGY STAR has a Most Efficient designation label recognizing products that deliver cutting-edge energy efficiency along with the latest in technological innovation. Windows are one of several appliances/devices that have units meeting these criteria. If interested, begin your search at ENERGY STAR’s Most Efficient 2015 web page. Using solar screens, shutters, or awnings to shade existing windows can significantly reduce your home’s solar heat gain. Reducing air leakage can significantly improve the efficiency of existing windows. Check caulking and weather-stripping around all openings to keep conditioned air in and un-conditioned air out of the home. R-Value – Refers to a window assembly’s resistance to heat flow; R-Value is the inverse of U-Factor (U=1/R), i.e., if the R-value of a window assembly is 2, the U-Factor is 0.5. Most people think of a window’s function as simply to allow light and air into the home. But when you think about it, a window in a Florida home has a rather complicated job: it must allow the sun’s light to pass through, but not the sun’s heat; it must keep cool conditioned air inside, but not allow condensation to form on the surface of the glass; it must not allow hot, humid outside air to leak into the home in summer, nor allow warm conditioned air to leak out of the house in winter; and, as Hurricane Andrew and other significant storms have demonstrated, windows are traditionally a key point of entry for storm-force winds, hail, rain, and wind-borne debris, so ideally a Florida window must also be impact-resistant. What are the primary concerns for Florida home envelopes with a lot of glass? Though glass is necessary for aesthetics, ventilation, light, and safety, it is a major cause of energy loss through your home’s shell (often referred to as thermal envelope). In the cold season, it is desirable to use solar heat to warm rooms in a home. However, because the warm season in Florida is much longer than the cold season, excessive solar heat gain is the biggest concern for our climate. Additionally, glass is easier to break than other parts of the home in the event of hurricanes and tornadoes. Energy-efficient windows, however, allow you to use more glass without additional energy penalties, and impact-resistant glass can help address the issue of breakage due to wind-borne debris. What are “energy efficient” or “high performance” windows? How do I know which windows keep out the most heat (solar heat gain)? The National Fenestration Rating Council (NFRC) provides energy performance labels (Figure 1) on windows, doors, skylights, and window films voluntarily tested by an independent third party for how well the product will perform the functions of cooling your home in the summer, heating your home in the winter, keeping out wind, and resisting condensation. The label also lists the manufacturer, describes the product, provides a source for more information, and includes a rating for how much light comes through the product. Basically, the NFRC label allows you to comparison shop. Keep in mind that the label is voluntary so not all products will have it. A = U-Factor (also referred to as U-Value) measures the amount of heat that escapes through the product. The lower the rating, the better the window is at preventing heat loss (as imagined, this is more of a concern in northern climates). NFRC certified products require U-Factor ratings. In Florida, always look for the whole window U-Factor and select windows with a U-Factor at least as low as 0.40. B = Solar Heat Gain Coefficient (SHGC) measures how well a product blocks heat caused by sunlight. The SHGC is the fraction of incident solar radiation admitted through a window, both directly transmitted, and absorbed and subsequently released inward. SHGC is expressed as a number between 0 and 1. A window with an SHGC rating of 0.70 will allow 70% of the solar heat to pass through it. The lower a window’s SHGC, the less solar heat it transmits. A high solar gain window will let in solar heat and trap it, increasing cooling load in the summer. In Florida, SHGC is the most important consideration in selecting windows that are exposed to direct sunlight. C = Visible Transmittance (VT) measures how much light comes through a product. The visible transmittance is an optical property that indicates the amount of visible light transmitted. VT is expressed as a number between 0 and 1. The higher the VT, the more visible light transmitted. Dark-tinted coatings can significantly reduce visible transmittance, but it is possible to get windows with high VT (about 0.70 for the glass or 0.50 for the whole window is best for maximum daylight and view) and low SHGC—greater amounts of light with less solar heat gain. D = Air Leakage (AL) is indicated by an air leakage rating, expressed as the equivalent cubic feet of air passing through a square foot of window area. Heat loss and gain occur by infiltration through cracks in the window assembly. The lower the AL, the less air will pass through cracks in the window assembly. E = Condensation Resistance (CR) measures the ability of a product to resist the formation of condensation on the interior surface of that product. Though this rating cannot predict condensation, it can provide a credible method of comparing the potential of various products for condensation formation. CR is expressed as a number between 0 and 100. The higher the CR rating, the better that product is at resisting condensation formation. CR is an optional rating, however, and manufacturers can choose not to include it. F = Emissivity (or Low-E) measures the efficiency in which a surface emits thermal energy. In case of Low-E windows, long wavelengths of light (or heat) are filtered out by a thin coating on the glass while short wavelengths of light (or visible light) are allowed to pass through). Sometimes I see ratings for windows, while other times just the glass rating is displayed—what’s the difference? A glass rating—logically enough—will indicate how the glass (glazing) itself performs. But a window is made of more than glass. The framing material, the number of panes of glass and air spaces between the panes, any coatings applied to the glass — all of these are components of the window and affect how the entire structure performs. The NFRC window rating indicates the overall performance, and thus is a better guide in choosing one particular type of window product over another. Note that the NFRC label, located next to the ENERGY STAR label, is found on all ENERGY STAR certified windows for the southern climate zone. What types of framing materials are available? Typical framing materials include wood, vinyl, aluminum, fiberglass, and composites. Manufacturers often combine materials to use the best features of each. For example, a variation of the wood-framed window is to clad—or cover—the exterior face of the wood frame with either vinyl or aluminum, creating a weather-resistant surface. Clad frames have lower maintenance requirements, while retaining the attractive wood finish on the interior. Although great for safety, sound protection, and aesthetics, frames with high insulation value are not as important for most Florida homes, but the frame material should be thermally non-conductive, and the whole window will ideally have an AL (Air Leakage) rating of 0.30 or less. Learn more about thermal breaks, spacers, frame types and more at the Efficient Windows Collaborative web page on window technologies. What type of window should I consider when building a new Florida home? Limit windows facing east and west as these would be subject to the greatest amount of sun exposure. In general, the most efficient window designs start at a minimum of three feet off the floor and end a maximum of six to seven feet from the floor. This design allows people to see out of the window while sitting or standing, without excess glass area. Avoid designs that call for sheets of glass installed directly into the walls, as plain glass is not good for energy efficiency. Are window designs tested for durability? The American Architectural Manufacturers Association (AAMA), Window and Door Manufacturers Association (WDMA), and Keystone Certifications, Inc., conduct voluntary design pressure tests for structural pressure, air infiltration, water penetration, and operational force. For those living in hurricane-prone areas, purchasing new windows with high-performance ratings in these rigorous tests is a good idea. (Contact your local government building permit office for assistance in choosing windows specific for your location.) Some Florida insurance companies may give a reduction in hurricane insurance premiums for windows that have been tested for impact resistance. Impact resistance is particularly important because if a window breaks, providing an opening into the home, pressure can build up inside, increasing the chance of the roof blowing off and/or significant water damage to the structure. How can I make my existing windows perform better? Windows should shut tightly when closed. Add shutters, awnings, and/or solar screens. Check caulking and weather-stripping on windows at least annually. Damaged weather-stripping and caulking should be completely removed and then replaced with new materials. The U.S. Department of Energy has a lot of information on recommended uses, etc., for different types of caulking and weather-stripping. Carefully read all product labels because some products will fail when subjected to certain or extreme conditions. How do I know if my windows need caulking and weather-stripping? When looking for drafts around your windows, check the outside for any sign of caulking that has cracked or peeled. A simple draft-checker, made with a piece of tissue paper taped to a metal clothes hanger, can detect even small breezes inside your home. While inside the home on a windy day, hold the draft-checker still at several places around the window and frame to detect leaks. If the tissue paper moves, then you know there is a leak allowing conditioned air to escape and unconditioned air to enter. Try this draft-checker technique around doors as well. You and a friend or relative can also try the “Can you see me now?” trick. At night, turn off all of the lights and shine a flashlight from the outside around exterior window and door frames. If your friend or relative sees light coming inside through cracks or crevices in or around those frames you’re examining, then you know there are areas for air to get in or get out. What should I know about shading devices? Outside treatments keep out more heat than indoor treatments and save you the most money. Remember, you are trying to stop heat from entering your home’s thermal envelope. Heat that stays outside the home in the first place doesn’t have to be cooled down! Shutters, awnings, and solar screens are good choices for shading. A solar screen is similar to the familiar insect screen mounted within a window casement. Quality solar screens block the sun’s heat and glare while offering good visibility from within the room. Solar films range from tints, which reduce light entering the home, to transparent films, which reduce solar radiation while still allowing light to pass through. Currently, window films are not eligible for the ENERGY STAR label but the NFRC independently certifies product energy performance. The NFRC makes these ratings available on its website here. More information on window films can be found through the International Window Film Association. Skylights are generally not recommended in Florida because they are vulnerable during hurricanes and require aggressive shading devices to protect against intense sun. However, natural daylighting is the most desirable and efficient form of light. Therefore, if you do want an ENERGY STAR certified skylight, make sure that it has the NFRC and ENERGY STAR label for the southern climate zone with an SHGC less than or equal to .28 and a U-Factor of 0.60 or less. Skylights do not have to be very large to get the desired effect, so select the smallest available size. The shaft should be insulated to conform to the Florida Building Code. Proper sealing and caulking are imperative to maintaining the roof’s integrity. If skylights are present in an existing home, consider adding window tint or a remote-control shade to reduce heat gain if you feel heat entering the room through the skylight. Impact-resistant glass is available as laminated glass and is also considered a type of safety glazing. Laminated glass consists of two or more panes of clear glass bonded together with clear plastic-like film (usually polyvinyl butyral) sandwiched between the two. Ranging in thickness from .015 to .090, this inner “filling” can be ordered in various colored tints to help reduce ultraviolet damage in the home, and it tends to hold the glass together upon impact. If cracked or broken, the glass fragments tend to adhere to the plastic interlayer thus preventing water, wind, or wind-borne debris from entering the structure. Note that the frames for laminated glass are generally heavier than for regular residential windows, because though an impact may not break through the layered glass, its frame must be able to bear the transferred force of a strong impact. When undergoing testing, the window is tested as a unit that includes the glass, frame, attachment hardware, and the installation method. Products designed to protect your home’s openings must be both tested and approved for design, pressure, and impact. There are testing standards set forth by the American Society for Testing & Materials (ASTM) and others that must be met before a window is certified as being impact-resistant. Tempered glass windows and impact-resistant windows are not the same. Tempered glass is one type of heat-treated glass in which the glass is first heated, and then the surface is rapidly cooled. This treatment results in the center of the glass remaining relatively hot compared to the surface. As the center thickness cools, it compresses the surfaces and edges. When tempered glass does break, it fractures into small, relatively harmless fragments. This phenomenon, often referred to as “dicing,” greatly reduces the likelihood of injury to people or pets. The Florida Building Code requires safety glazing material, such as tempered glass, where there is a reasonable likelihood of exposure to human impact, such as indoor assembly areas, bathtub or hot tub enclosures, railings of glass adjacent to stairways, etc. Safety glazing materials are designed to reduce or minimize the likelihood of cutting and piercing injuries when broken by human contact. Keep in mind that all glass other than impact-resistant window glass needs to be protected during severe wind events, even if tempered, reinforced, or insulated. If replacing windows in pre-1978 housing, be aware that the paint in window frames and nearby areas may contain lead. If this is true for your home, follow all safety precautions to prevent lead poisoning through dust and lead paint chips. In effect since April 2010, contractors performing renovation, repair and painting projects that disturb lead-based paint in homes built before 1978 must be certified and follow specific work practices to prevent lead contamination. Learn more about this here. Simulation programs like RESFEN, a personal computer program for calculating the heating and cooling energy use of windows in residential buildings, let you compare window performance options by calculating utility rates for your climate, house design options, and window design options. An online site developed by the non-profit Efficient Windows Collaborative offers a less detailed opportunity to compare new and replacement window choices. When looking for upfront financial incentives related to renewable energy and energy efficiency, visit the Database of State Incentives for Renewable & Efficiency (DSIRE) website and enter your zip code. You may also want to check with your local utility provider for any window-related incentive programs. American Council for an Energy-Efficient Economy (ACEEE). Windows and Doors. Retrieved May 6, 2015. American Architectural Manufacturers Association (AAMA). Retrieved May 6, 2015. American Society for Testing and Materials (ASTM). Retrieved May 6, 2015. Efficient Windows Collaborative. January 2015. Selecting Energy Efficient New Windows in Florida. Retrieved May 6, 2015. Window Selection Tool for New Construction. Retrieved May 6, 2015. Window Selection Tool for Existing Construction. Retrieved May 6, 2015. Federal Alliance for Safe Homes (FLASH). Retrieved May 6, 2015.
International Code Councile (ICC). Florida Building Code 5th Edition (2014) Residential. Retrieved May 6, 2015. Jeld Wen Windows & Doors. Clearing Up Low-E Confusion. Retrieved May 13, 2015.
International Window Film Association (IWFA). Retrieved May 7, 2015. Lawrence Berkeley National Laboratory, Building Technologies Department. Software Tools. Retrieved May 7, 2015. Miller, C., Sullivan, J., and S. Ahrentzen. 2012. Energy Efficient Building Construction in Florida. ISBN: 978-09852487-0-3. University of Florida: Gainesville, FL. National Fenestration Rating Council (NFRC). Retrieved May 6, 2015. U.S. Department of Energy. Database of State Incentives for Renewables & Efficiency (DSIRE). Retrieved May 6, 2015. U.S. Department of Energy. May 7, 2012. Caulking. Retrieved May 6, 2015. U.S. Department of Energy. May 7, 2012. Weatherstripping. Retrieved May 6, 2015. U.S. Environmental Protection Agency. Renovation, Repair and Painting Program. Retrieved May 6, 2015. U.S. Environmental Protection Agency and U.S. Department of Energy. ENERGY STAR. Retrieved May 6, 2015. This document is FCS3276, one of an Energy Efficient Homes series of the Department of Family, Youth and Community Sciences, Florida Cooperative Extension Service, Institute of Food and Agricultural Sciences, University of Florida. This material was initially prepared in June 2008 with the support of the Department of Environmental Protection, Florida Energy Office, which is now the Office of Energy, Florida Department of Agriculture and Consumer Services. This revised version was prepared June 2012 with the support of the Florida Energy Systems Consortium (FESC) and updated May 2015. Any opinions, findings, conclusions, or recommendations expressed herein are those of the author(s) and do not necessarily reflect the views of the sponsoring organizations. Please visit the EDIS website. 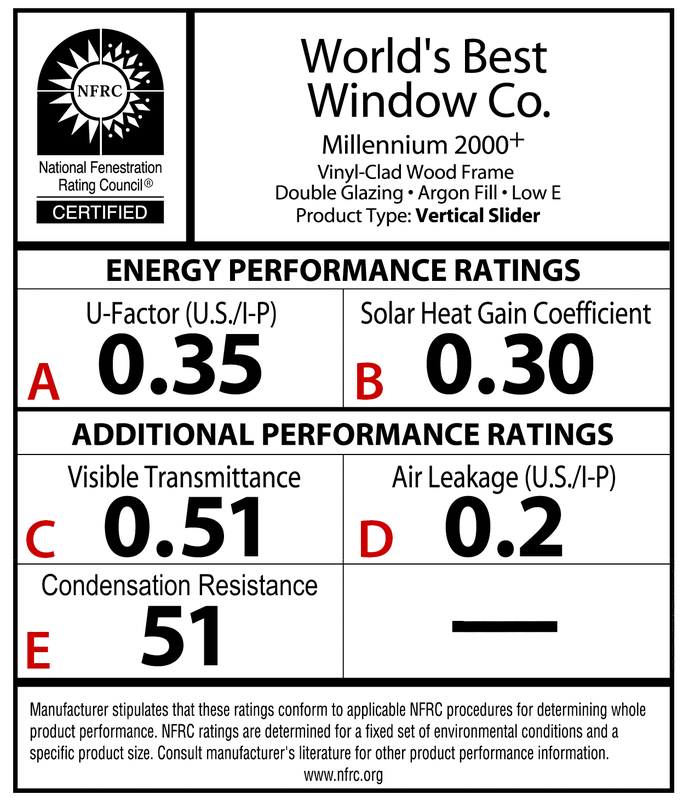 To be eligible for ENERGY STAR, products must be rated, certified, and labeled for both U-Factor and Solar Heat Gain Coefficient (SHGC), in accordance with the procedures of the National Fenestration Rating Council (NFRC) for the specific climate zone (see ENERGY STAR’s Independently Tested and Certified Energy Performance web page for more information). Currently ENERGY STAR certified windows for the Southern Climate Zone, which is all of Florida, must have a U-Factor of 0.40 or less and a SHGC of 0.25 or less. Term coined by T. Prescott, University of Florida.